At Springdale Farm in Waldo, 92-year-old Lois Whitcomb is trying to create a future for the farm she purchased with her late husband, Colby, in 1951. At 488 acres, this large, protected farm property is the result of multiple land purchases over time. Springdale Farm is primarily an active, multi-generational dairy that enjoys the contributions of multiple family members working to keep the farm viable. Lois, her children, and grandchildren have and continue to raise other farm products as well, such as beef and veal, strawberries, and eggs (the latter of which Lois’s children fondly remember delivering by bicycle). After her late husband’s death, Lois wanted to do something to honor the family’s farming legacy, and to make sure that her land would always be available for farming in the future. Colby always wanted to have the farm protected, and Lois sought to honor that desire, contacting MFT initially in 2011 to discuss options. She and her family eventually decided on a purchased easement to help create some financial stability for the continued viability of the farm. In July 2015, the 488 acres became a protected farm. Although Lois is now 92, she remains actively involved in the farm’s production. She continues to raise many of the calves, as she has done for years. Lois also nurtures award-winning Guernsey and Jersey replacement heifers. Over the decades, the farm has continued to produce milk and prize calves, and has even expanded into other enterprises. Most of the milk is sold through Oakhurst Dairy; some is also supplied to local cheesemakers. Lois’s granddaughter Carrie manages the farm, and has expanded production to rose veal, pork, beef, lamb, and highbush blueberries. Carrie is looking into other value-added channels as well, hoping to find a new way forward for the farm. Maine’s aging dairy farmer population, many of which do not have succession plans for their farms, combined with falling milk prices, means that the state’s dairy industry is suffering. Many farmers face issues of transition and debt and look towards their farms’ futures, even as they work to keep farms going in the present. Protecting Springdale Farm both safeguards the land against future development and consummates the family’s decades of work on the property. 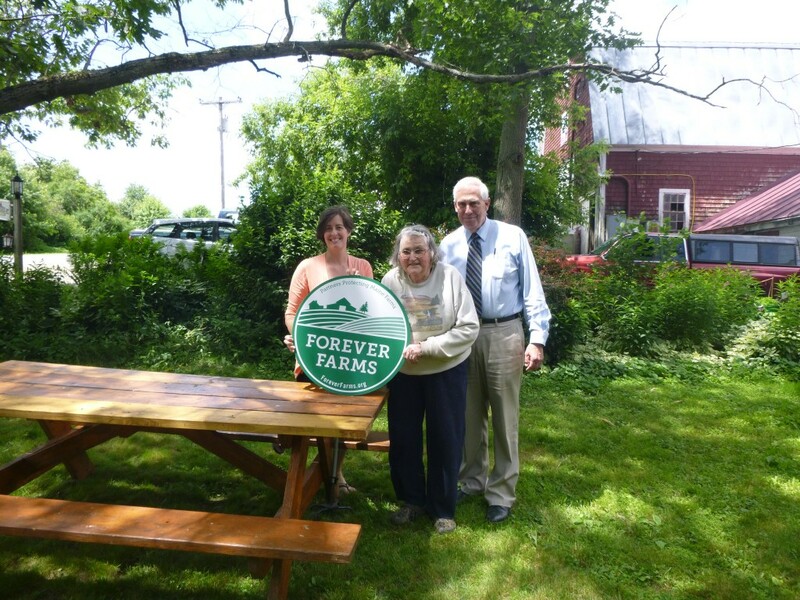 The sale of an easement will help to facilitate the transition of the farm to the next generation, fortifying Lois and Colby’s legacy as well as the future of dairy farming in Maine. “My husband Colby didn’t spend his entire life trying to put this farm together in order to see it grow up to houses,” says Lois. Her continued dedication, too, is now anchored, and her life’s work preserved for the next generation of farmers.